From the day that it launched in 1987, Kensington Place was the restaurant hangout of choice for trendy foodies, media types and trustafarians. When chef Rowley Leigh packed his bags and left in 2006, it seemed like the end of an era. But late last year, Leigh rewarded his devotees by opening a new place in an unlikely location.The Whiteley’s arcade in Queensway was, until recently, home to the contents of your average shopping mall: to wit, an M&S, a Waterstone’s, a Next and a hodge-podge of generic chain restaurants, as well as a multiplex cinema. The generous wine list, which is dedicated to the Old World, is a reflection of Leigh’s tastes. It features 20 wines by the glass as well as 250ml carafes – all, says Leigh, to encourage diners to taste flights of wines. Leigh ascribes his interest in wine to his upbringing. ‘I don’t think any of my parent’s generation drank a huge amount of wine,’ he says. ‘Gin and It was their drink of choice. But in the 70s my father bought three cases of fine claret – Latour 62 and Margaux 59 – and that was a revelation. 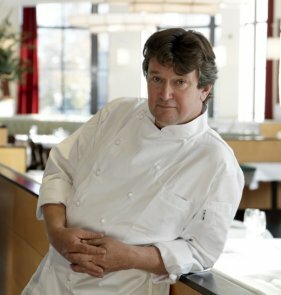 Like many chefs, Leigh’s had no formal training in wine, but says that experience ‘It lit a flame – and has been a slow-burning passion ever since.’ He has had the benefit of spending time with the elite of the British wine trade, and says: ‘I’ve learned most from wine merchants, quite a few of whom have become great friends, people like David Gleave, the late Bill Baker and Robert Rolls. Wittmann’s Morstein Riesling Grand Cru, Rheinhessen, 2005At £70 on the Café Anglais list, this is a fairly trocken (dry) Riesling with enough weight and body to cope with the fatness of the herring. It’s got a slight sweetness, which creates an overall effect of traditional Eastern European flavours when combined with the herring. Pieropan Calvarino Soave Classico 2005At £35 on the Café Anglais list, you’ll find fruit flavours in the Soave, but also a hint of oak and good mid-palate weight, all of which allows the wine to stand up to the pork. I find it very hard to find red wine matches with pork, I think the fat gets in the way. You need acidity to help cut through the pork fat, so I tend to look for a well-bodied white and the Calvarino does the trick. Richard Leroy Le Clos des Rouliers, Anjou 2005At £7 per glass/£14 per carafe/£37.50 per bottle on the Café Anglais list, there’s something about the combination of a very sophisticated Chenin Blanc with a bit of residual sugar, terrific weight and length that allows it to cope with the strong flavours of the salt-washed cheese. Nearest tube: Queensway. Apart from the high ceilings and Art Deco windows, there’s nothing too exciting or glamorous about the décor of the Café Anglais. But maybe chef Rowley Leigh prefers a neutral backdrop to enhance the brilliance of his cuisine. Leigh is a follower Escoffier’s dictum: ‘Faites simple’. His menu could have been written by Elizabeth David, with its assortment of classic hors d’oeuvres, simple starters and pared-down main courses. Not for Leigh the contemporary elaborations of froths, foams and fusion cuisine. Instead, you can kick off your meal (as we did) with a small pot of Parmesan custard and anchovy toast, a sublime combination of salty umami flavours with creamy and crunchy textures. Less successful were the salsify fritters, which had a touch too much batter to allow them to be as crisp as they should have been, although their shortfalls were redeemed by a meltingly sweet, fatty rabbit rillettes, which was put into focus by a side of pickled endive. We gave the starters a miss – a shame, because the risotto with pancetta and artichokes sounded wonderful, as did the sea kale with poached egg and truffles – but we wanted to leave room for our mains. This proved to be a good decision as the plateful of sea bass with salsa verde was generous, as was the serving of red mullet with purple sprouting broccoli and anchovy butter. Both dishes were sublimely cooked, allowing the sweet fresh flavours of the fish to really stand out. A side of roast aubergine with new-season garlic and cherry tomatoes provided just enough vegetal vim and vigour to complement the fish. The wine list reads like a tour through some of the best appellations of France, Italy and Germany, but rigorously excludes other countries. Still, you hardly notice the lack of Spain and Australia when faced with the option of selecting Jasmin’s Côte Rôtie 2002 at £50 or a carafe of Bonneau de Martray’s Corton Charlemagne 1998 (£35). Service was of a piece with the Café’s ethos: elegantly restrained, engaged and informed. Our waiter brought us coffees, but seemed disappointed we didn’t want a dessert. The truth is, we did: the dessert list looked great. But we decided to leave wanting more. In fact, as we left, my fellow luncher stopped by the reception desk to book a birthday dinner for his partner the following week. And, as far as I’m concerned, any restaurant that makes you want to book your next meal as you’re finishing off the crumbs of your first, has to have something pretty special going for it.